Here, alternating in Deutsch and English, are my Riesling Heroes of 2014. Riesling-Helden? Klingt das nicht abgedroschen? Vielleicht schon. The Stranglers haben 1977 sehr überzeugend „No More Heroes“, keine Helden mehr, gesungen. Dieses Lied gegen Helden begeistert mich heute wie damals. Die Stranglers hatten durchaus Recht, weil das 20. Jahrhundert der Welt ein Überangebot an Demagogen und idealistischen Ungeheuern geliefert hat. Sie haben sich als Helden verkleidet ins Rampenlicht gestellt und Millionen von Menschen über den Tisch gezogen. Aber Riesling ist nicht Macht oder Ideologie, sondern ein besonderes Getränk, das Millionen von Menschen Freude bereitet. Meiner Meinung nach ist jemand, der sich hartnäckig und nachhaltig dafür einsetzt, diese Freude zu vergrößern Riesling-Held oder -Heldin. Weil die Leistung dieser Menschen eine größere Bekanntheit verdient, habe ich die Auszeichnung „Riesling Held(in) des Jahres“ ins Leben gerufen. Heute stelle ich die ersten Preisträger vor. Riesling Heroes? Does that sound dated or clichéd? Maybe it does. The Stranglers famously sung “No More Heroes” back in 1977, a song seriously excited me back then and still does today. They were right. The 20th century gave the world an overdose of demagogues and idealistic monsters who dressed up in heroic garb, grabbed the spotlight and pulled the wool over millions of people’s eyes. However, Riesling isn’t power or ideology, it’s a remarkable beverage that gives enormous pleasure to millions of people. For me anyone who works long and hard to expand that joy against all the odds qualifies as a Riesling Hero. Because these people need to be more widely known I am creating a prize for the Riesling Hero(es) of the year and giving it today for the first time today. Meine (oben abgebildeten) Riesling-Helden 2014 sind (von links nach rechts) Pascal Brooks, der Besitzer von Brooks Wines in Oregon, Janie Brooks Heuck, die Verwalterin, und Chris Williams, der Winemaker. Pascal ist der Sohn des 2004 frühzeitig verstorbenen Gründers Jimi Brooks. Janie ist Jimis Schwester, die bis zu dessen Tod nichts von Wein verstanden hat, und Chris war zu Jimis Lebzeiten seine rechte Hand im Keller. Jetzt entwickelten sie gemeinschaftlich die besondere, von Jimi erfundene Weinstilistik weiter, vor allem bei Riesling und Pinot Noir. Ihre Geschichte habe ich ausführlich in PLANET RIESLING erzählt, aber sie ist damit nicht zur Ende. 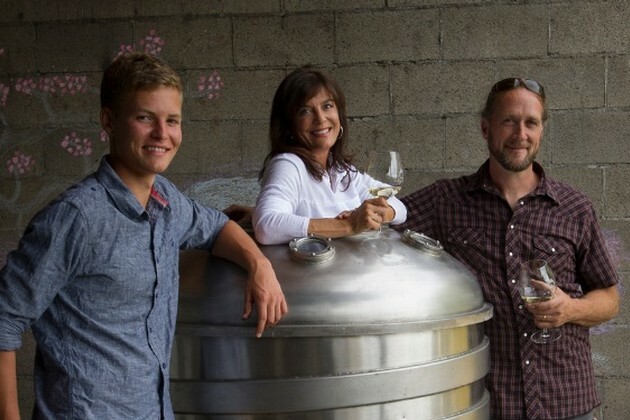 My Riesling Heroes 2014, pictured above, are, from left to right, Pascal Brooks owner of the Books winery in Oregon, General Manager Janie Brooks Heuck and winemaker Chris Williams. Pascal is the son of founder Jimi Brooks, Janie is his sister, who prior to Jimi’s sudden death in 2004 knew nothing about wine, and Chris was Jimi’s assistant in the cellar. Together they continue to develop Jimi’s distinctive wine styles, particularly those for Pinot Noir and Riesling. I told their story at some length in BEST WHITE WINE ON EARTH, but this story keeps developing. Schon bevor mein Buch erschienen ist, hat Janie mit ihrer rechten Hand, Jess Pierce, die RIESLING INVASION in Portland/Oregon organisiert. Diese größte Präsentation von Oregon Riesling-Weinen aller Zeiten begeisterte am 19. Juli mehr als 300 Fans. An diesem Tag wurde mir klar, dass Oregon eine kompakte, aber äußerst dynamische Riesling-Szene hat, die von den Wein- und Gastro-Medien immer noch nicht richtig wahrgenommen wird. Den Grund dafür habe ich in meinem Buch „Pinot-Nebel“ genannt. Mehr als 60% der Gesamtrebfläche Oregons ist mit Pinot Noir bestockt, weitere 10% mit Pinot Gris. Zusammen lenken sie die Aufmerksamkeit der Konsumenten und Journalisten von Riesling und anderen Traubensorten ab. Already before my book had appeared, together with her right hand woman Jess Pierce (officially she’s Director of Wine Education), Janie was planning the RIESLING INVASION event that took place in Portland/Oregon on Saturday, July 19th. It was the largest presentation of Oregon Rieslings ever and attracted a crowd of more than 300 fans. The event made plain to me how Oregon has a compact, but very dynamic Riesling scene to which the American wine and gastronomic media long paid too little attention. This is because of what I call in my book, “Pinot fog.” The dominance of Pinot Noir (more than 60% of the state’s vineyards!) and Pinot Gris (another 10%) in the Oregon wine industry seriously distract popular and media attention from Riesling, and everything else too. Während dieses Oregon-Besuchs ist es mir auch klar geworden, dass das Brooks-Team nicht die einzigen Riesling Helden in diesem Bundesstaat sind. Die Peterson-Nedrys der Chehalem Winery – Vater Harry (oben doppelt abgebildet) und seine Winemaker-Tochter Wynne – verdienen ebenfalls diese Auszeichnung. Und seit ein paar Jahren steht sie auch Andrea und James Frey von Trisaetum zu. Aber nur Janie Brooks Heuck ist so oft und so hartnäckig in Sache Oregon-Riesling unterwegs. Sie hat diese Weine zu einem Thema gemacht, das von den Mitgliedern der amerikanische Weinszene nicht mehr leichtsinnig ignoriert werden kann. Manche tun es trotzdem und geben dabei keine gute Figur ab. 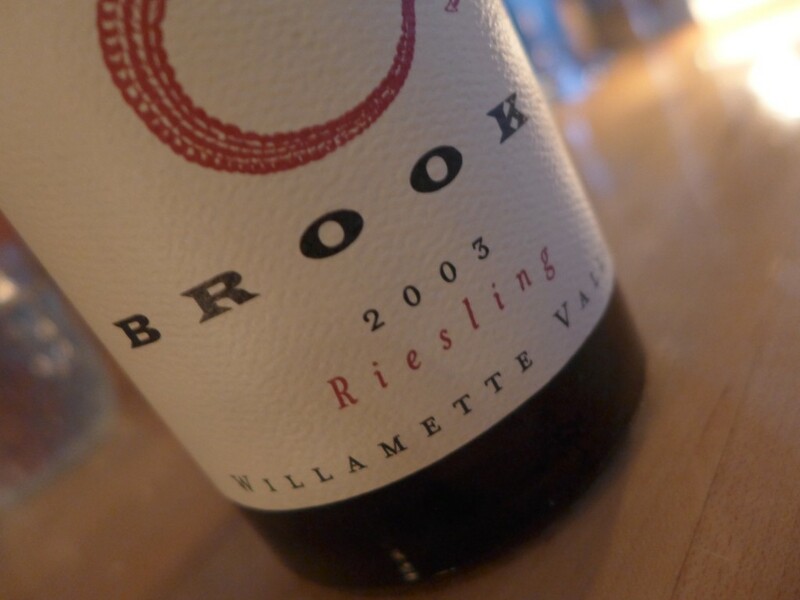 During that visit to Oregon I also realized the Brooks team aren’t the only Riesling Heroes in this state. 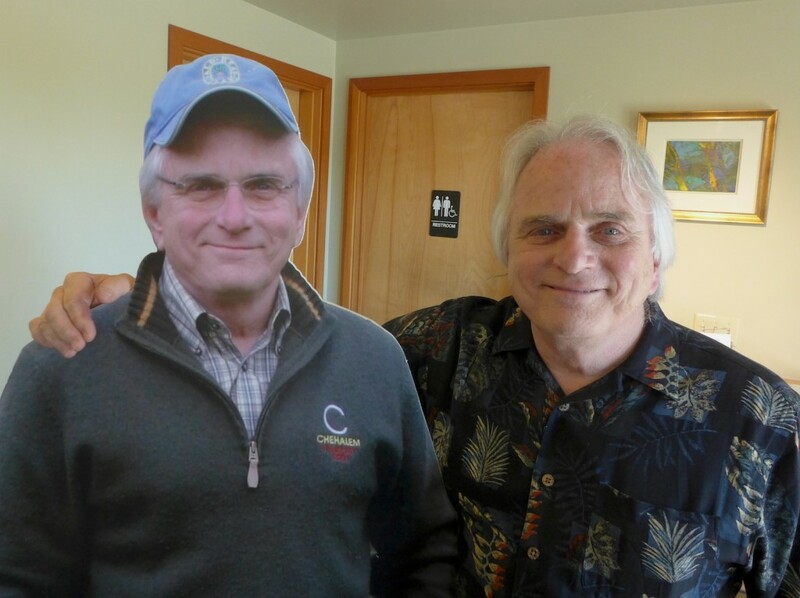 The Peterson-Nedrys of Chehalem Winery – father Harry (pictured above with his double) and winemaker daughter Wynne – have long deserved that accolade. And in the last couple of years Andrea and James Frey’s of the Triseatum winery have earned a claim to the title too. However, it is Janie who goes out on the road and makes a Big Noise about Oregon Rieslings that makes it almost impossible for people in the American wine scene to ignore them any more. Of course, some still do, but I think they end up looking a bit ridiculous. Im stillen Kämmerlein des Kellers arbeitet Chris Williams weiter an der Verfeinerung der Brooks-Rieslinge. Er hat das Sortiment in die zart-süße (die Spätlese-artige ‚Sweet P’) und süße (der mächtige und super-konzentrierte ‚Tethys’) Richtung erweitert. Staubtrockene Weine bleiben der Kern des Sortiments, und da setzt Chris so konsequent auf Spontangärung wie kaum ein anderer Riesling-Winemaker des Kontinents. Seine Weine sind Langläufer mit enormem Entwicklungspotential. Es gibt nur ein Handvoll trockener Weine auf dem PLANET RIESLING, die am Anfang ihres Lebens so karg und mineralisch wirken und durch Flaschenreife so viel Charme gewinnen. Diese Weine regelmäßig zurückzuhalten und erst auf den Markt zu bringen, wenn sie aufblühen, verlangt nicht nur starke Nerven, sondern auch einen Businessplan, der wie Janies extra darauf ausgerichtet ist. Back at the ranch, Chris Williams has been quietly perfecting the Brooks Riesling and extending the range from its dry core into the medium-sweet (the deliciously succulent ‘Sweet P’) and sweet (the unctuously concentrated ‘Tethys’) directions. Chris has strong principals that derive from his deceased mentor, and I don’t know any other Riesling winemaker in America who is so committed to wild ferments, or makes that work so well. His wines are all built for the long haul and have enormous ageing potential. I can’t think of more than a handful of other dry Rieslings on the planet that start life this austere and mineral, but gain so much charm as they age. Systematically holding these wines back and only releasing them when they begin to blossom requires not only strong nerves, but also the business plan Janie designed for that. Neben der ganzen anderen Arbeit hat Janie den Betrieb im letzten Jahr durch eine große Umstellung gesteuert. Der alte Keller war nicht nur klein, er war viel zu klein für die Produktionsmenge und verlangte von Chris eine Meisterleistung an Improvisation. Inzwischen ist die geräumige neue Kellerei an der Spitze der Estate Vineyard in den Eola-Amity Hills im Betrieb. Die Riesling-Helden 2014 haben eine neue Heimat! The old Brooks winery was not just compact, it was tiny for the amount of wine that Chris Williams had to make there. I was amazed by his improvisational talent, without which this wouldn’t have been possible at all. On top of everything else going on during the last year Janie oversaw the construction of Brooks new winery at the top of their hillside Estate Vineyard in the Eola-Amity Hills. The Riesling Heroes of 2014 have a new home! Great article and thanks for sharing your perspective. I can’t believe I’ve somehow not been to the Brooks estate yet and I have it on the top of my list for the next trip. I would love to order products online, also – but the shipping is really ridiculous. We need to do something about this part of the business, as it is killing small business owners being able to extend the reach of their excellent products. In the program ‘Strange Inheritances’, it gave states where Brooks wine was sold and North Carolina was one of them. It was also said that Brooks wine was carried by Whole Foods. I live in Raleigh, NC. Can you tell me anywhere in NC where Brooks wine is sold? From what I read above about the shipping costs, and being a senior citizen, I know I could not afford to order online with the shipping costs. I am hoping you can indicate the locations, hopefully Raleigh, NC, where I can buy Brooks wine, otherwise, unfortunately, I will not be able to support your business.